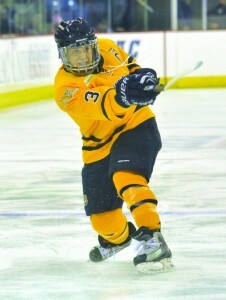 After growing up and playing in boys’ ice hockey leagues in Wasilla, Alaska, Jordan Elkins moved across the country to Hamden to play Division I women’s ice hockey for Quinnipiac. She is ready to begin a new stage of her life: coaching hockey. Elkins, the captain for Quinnipiac’s women’s ice hockey team last season, is ready to move to Dallas and take part in a new career of coaching for the Dallas Stars Elite Hockey Club. She was recently named the head coach of the Dallas Stars Elite Hockey Club’s U-14 team and U-12 Tournament team, and the assistant coach for the U-19 team. Over winter break, she visited her family in Texas. On the plane back from Texas, she witnessed some young hockey girls sitting next to her. She said she asked them about what team and tournament they were involved in. After talking with one of the parents about visiting colleges while they were playing in the area, she offered to give them a tour of the High Point Solutions Arena at TD Bank Sports Center and even let them watch one of the Bobcats’ practices. Elkins did not know that the president of the Dallas Stars Elite Hockey Club was in the group. About a week later the team called to express interest in her. Elkins waited until after the season ended to make her decision, especially taking her time since she would be moving halfway across the country for a second time. Over her four-year career, Elkins compiled 36 points with nine goals and 27 assists. But, it is not the stats the matter, but the leadership position that Elkins will be bringing to Texas. Quinnipiac head coach Rick Seeley believes Elkins has the attitude and demeanor that makes her really stand out. From a coaching standpoint, Elkins has been very easy to relate to. “She understands better than most … what coaches are going through from the other side,” Seeley said. Seeley says that Elkins was not set on what she was going to do or where she wanted to move after graduation. One important part of coaching competitive hockey is the differences Elkins will experience after playing college hockey. “You deal with a lot more parents, and there is obviously a fairness element that doesn’t exist in the college game so it’s a lot different coaching teenage kids than teenagers in college,” Seeley said. The Dallas Stars Elite Hockey Club gives both male and female players a chance to play a competitive travel schedule with the opportunity to play in front of college scouts. Elkins played on Wasilla’s boys’ hockey team all four years of high school and played a little of a different style. “Through working hard, situations have opened up and Quinnipiac was one of those situations,” said Elkins, who was also an assistant captain for her high school hockey team as a senior. Elkins will fly down to Texas the first week of June for tryouts. However, she will not move down to Texas until later in the summer. The season starts toward the end of the summer with tournament play beginning. Being captain at Quinnipiac has helped Elkins see what others can’t. For Elkins, she didn’t have a figure to look up to when she was playing competitive hockey growing up in Wasilla. At 14, they start checking in boys’ hockey and in her hometown of Wasilla there weren’t enough girls to play girls’ ice hockey, so Elkins played with the boys until she came to Quinnipiac. “I had a lot of parents tell me to stop playing hockey in general, that I couldn’t do it that I was going to get hurt,” Elkins said. Even Elkins’s coach notified her parents that she should be playing somewhere else. Elkins has continually proved her doubters wrong.